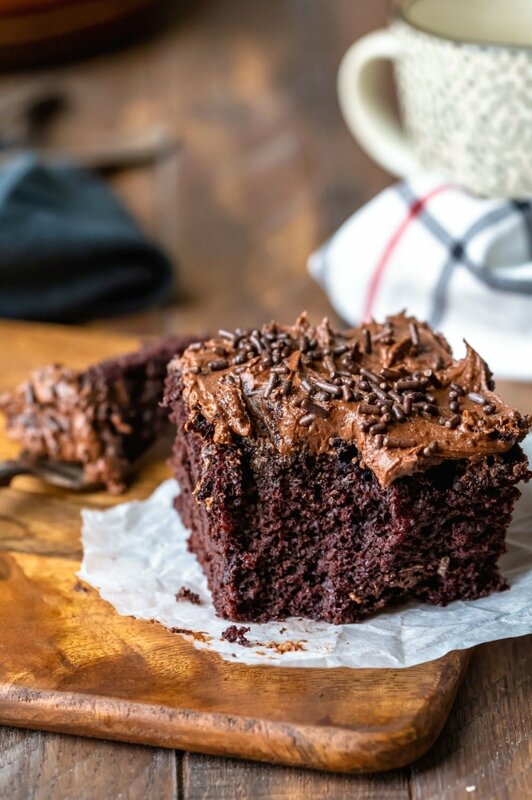 Wacky cake (depression cake or crazy cake) is a light and fluffy one bowl chocolate cake. 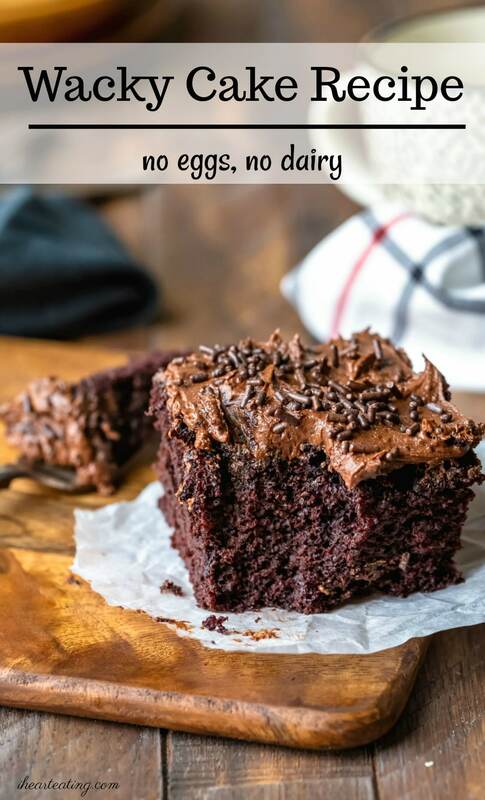 This is how to make cake without eggs or dairy! As much as I love making dessert, there are days when I just don’t have time to spend baking an elaborate dessert. Other times, I go to bake a cake and find that I’m out of eggs (or butter or both!). 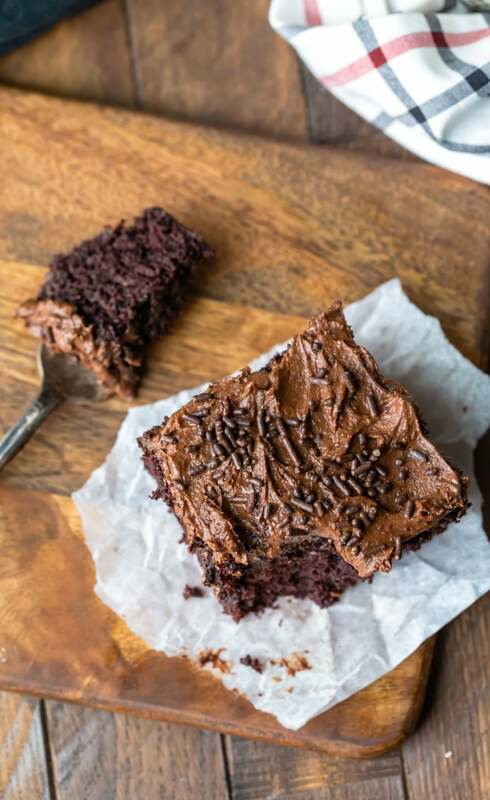 This wacky cake recipe is a light and fluffy one bowl chocolate cake that’s the perfect dessert for those times! It only takes about 5 minutes of prep, is both egg-free and dairy-free. Wacky cake is sometimes called crazy cake, depression cake, or WWII cake. It’s a simple chocolate cake that’s made without eggs, milk, or butter. The wacky cake recipe supposedly came about during WWII when items like eggs and butter were rationed. The “wacky” in wacky cake comes not only from the lack of dairy and eggs but also from the method for making the cake. There are two ways to make this cake – one in a bowl and one in the baking pan. I prefer to make it in a bowl because I’ve found that it’s easier to remove the cake from a greased cake pan. I like to use my chocolate buttercream frosting with this cake. The rich chocolate buttercream pairs well with this cake because the cake isn’t overly rich or sweet. Really, though, it would go well with any number of frostings like my whipped buttercream frosting, salted caramel buttercream frosting, or even Oreo frosting. Or you can skip the frosting and just dust the cake with a little powdered sugar. I store the cake, covered, at room temperature. I think it’s best eaten in the first 2 days that it’s made (but I don’t think that most baked good are very good by day 3). 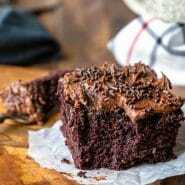 More vintage chocolate cake recipes! If you’ve tried this wacky cake recipe, don’t forget to rate the recipe and leave me a comment below. I love to hear from people who’ve made my recipes! You can SUBSCRIBE to receive my latest recipe newsletters or FOLLOW ME on FACEBOOK, INSTAGRAM and PINTEREST for even more delicious food. Place the dry ingredients (flour, sugar, cocoa powder, baking soda, and salt) in a bowl. Pour water over the top, and whisk to combine. Pour into a lightly greased 8x8-inch metal baking pan. Bake for 30-35 minutes, or until a toothpick inserted in the center comes out clean. *Can use a different type of oil. I also like melted coconut oil. **Need a frosting recipe? I use my chocolate buttercream frosting. Yummy Yummy Yummy! Looks so vibrant and lovely! I can’t WAIT to try this! Thank you for this great recipe! If i want to use coconut oil, how much should i use? Thank you so much!! Been looking for a dairy free and butter free cake since my boyfriend recently noticed he is lactose intolerant. Can’t wait to make this cake! You can use an equal amount of coconut oil (6 tablespoons). I love using coconut oil in chocolate cakes because it makes them even fluffier. =) Hope you guys enjoy this cake as much as we do! Thank you so much!!! Will be doing this cake very soon? OMG!!! The cake was so good!! 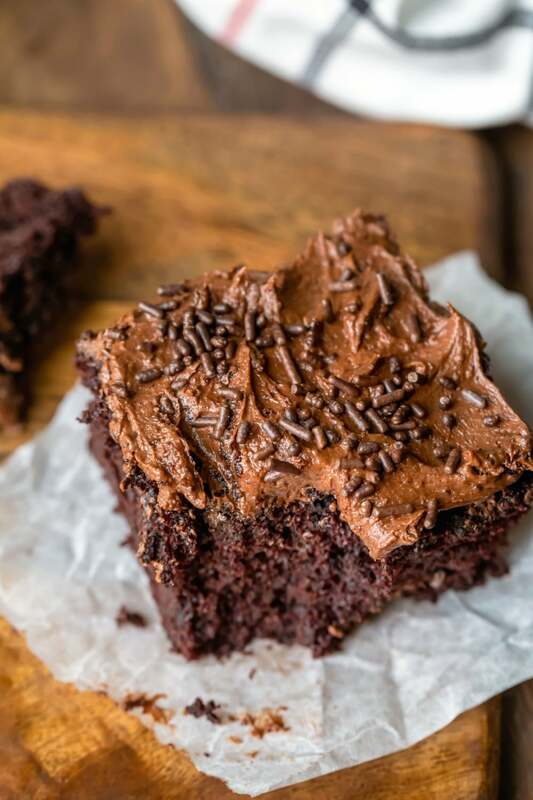 I made your chocolate frosting recipe to frost it and everyone loved it!